Yes, you've heard it before. But this time, it's for real: Greece is running out of time. To be precise, it has four days to accept the conditions creditors have attached to more bailout cash, or risk a financial crisis that could force it out of the eurozone. Greece needs to find 1.54 billion euros ($1.7 billion) to pay the International Monetary Fund by June 30 to avoid default. To do that, it needs the last tranche of its 240 billion euro ($262 billion) bailout. But the 7.2 billion euros will only be released if the anti-austerity government agrees to economic reforms, something it has resisted since February. A series of meetings over the past week have failed to reach a breakthrough, and the IMF walked away from the talks last week. Eurozone finance ministers will try again on Thursday but the omens are not good, and if a deal is further delayed, there may not be enough time to implement it before the end of the month. "It will get more difficult to strike a deal and to get it ratified across Europe if Greece does not get real this week," said Holger Schmieding at Berenberg bank. Things could even come to a head sooner than June 30 if savers start pulling money out of Greek banks again, fearing the worst. The grim news from Greece dragged markets down Monday. 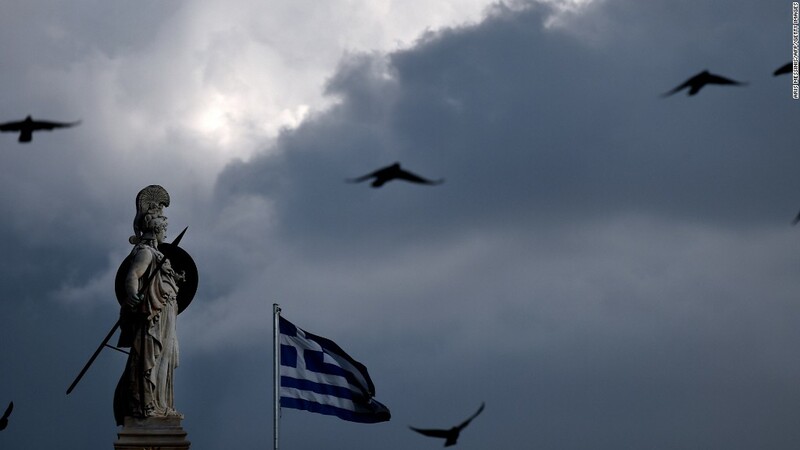 The key Athens index dropped by about 7.5%, and Greek 10-year bond yields soared above 12%. Other key indexes in Europe, as well as Wall Street, took a hit after Greece refused to accept the latest proposal from its lenders at a meeting on Sunday. The Greek government rejected demands for pension cuts and some increases in sales tax. European leaders are losing patience with the Greeks. All three of Greece's major financial backers -- the IMF, the European Central Bank, and fellow eurozone governments, have hardened their position, saying it was up to Athens to make concessions. "Watch out, we are arriving at a time that could be turbulent if we don't reach an agreement," said French President Francois Hollande. European Central Bank President Mario Draghi said the "ball lies squarely" in the hands of the Greek government. Greece is digging its heels in, perhaps hoping Europe will blink at the last moment. Greek Prime Minister Alexis Tsipras accused the creditors of acting out of political motives and said Greece would wait patiently until they "adhere to realism." Related: Greek deal: Progress! What progress? CNN's Chris Liakos contributed to this report.